BEFORE: Today marks the beginning of a three-day, four-film Quentin Tarantino chain which also means a lot more crime films. AFTER: Jackie Brown is like the bowl of porridge in Goldilocks; it’s just right. There isn’t anything particularly fantastic about this film, nor is there anything terribly horrible. Everything is just about average. I’m a big fan of Tarantino’s signature style and it’s readily apparent in this film. The colorful language, black comedy, and Samuel L. Jackson are all present and accounted for. The film also features some great performances by Pam Grier as the titular Jackie Brown and Robert Forester as the bail bondsman Max Cherry. But there was nothing about this film that really stood out for me. 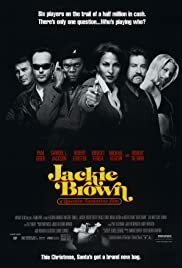 Jackie Brown was entertaining and was enjoyable to watch, but it wasn’t memorable in the same way that Pulp Fiction or Reservoir Dogs was.